Dervla McTiernan’s debut The Ruin, introducing Irish detective Cormac Reilly, was a hit. It’s already been optioned for film by Australia’s Hopscotch Features. So it’s safe to say this follow-up has been highly anticipated. Reilly is first on the scene when his partner, Dr Emma Sweeney, finds a hit and run victim outside Galway University. Her instinctive call to him means Reilly lands a case he never otherwise would have been called on to investigate; and it’s a big case. A security card in the dead woman’s pocket soon identifies her as Carline Darcy, a gifted student and heir to Irish pharmaceutical giant Darcy Therapeutics. The profile is high and the pressure even higher as Cormac investigates and evidence mounts that the death is linked to a Darcy laboratory and, increasingly, to Emma herself. Eventually, he is forced to question his own objectivity. The plot’s intricate and satisfying and it’s definitely a page-turner – I made a few half-hearted attempts to put it down, but I kept picking it up again. I was supposed to go to a party that Saturday night. Needless to say I didn’t make it to the party. Charismatic Reilly and his beautiful, brilliant yet troubled girlfriend Emma Sweeney are intriguing. Not irritatingly virtuous, but likeable and nuanced. I’m already looking forward to seeing how they develop in the next book. All the characters, in fact, particularly the police – such as lazy and resentful Moira Handley (who sounds creepily close to Myra Hindley), harassed and overstretched Carrie O’Halloran, smart and loyal Pete Fisher – feel authentic, all drawing the reader to invest more deeply in the story. I’m already hoping to meet them again in the next book. McTiernan is a former lawyer from Ireland who has moved to Western Australia and the book’s glimpses into the Irish police force feel exotic to a Perth reader, and totally convincing in their procedural and legal detail. Ireland’s an ideal setting for crime novels, with its atmospheric landscapes and complex social history, and I’m not the only one who loves it; before, I only really knew of Ian Rankin, but it turns out Irish crime is booming, leading to nicknames such as Celtic Crime, Hibernian Homicide and Emerald Noir (the latter coined by beloved Scottish crime author Val McDermid). I’m so happy to add Dervla McTiernan to my must-read list. Since she now lives in Perth, I get the Irish settings I love with the chance to support a local author. Win-win! This was a solid read, and I can’t wait to see this writer develop into a stalwart of the genre. I have a feeling Detective Cormac Reilly will be around for a while yet. Part 18 serves as a prime example of why I have resorted to a project like this to pull my book buying, reading and keeping habits into line. 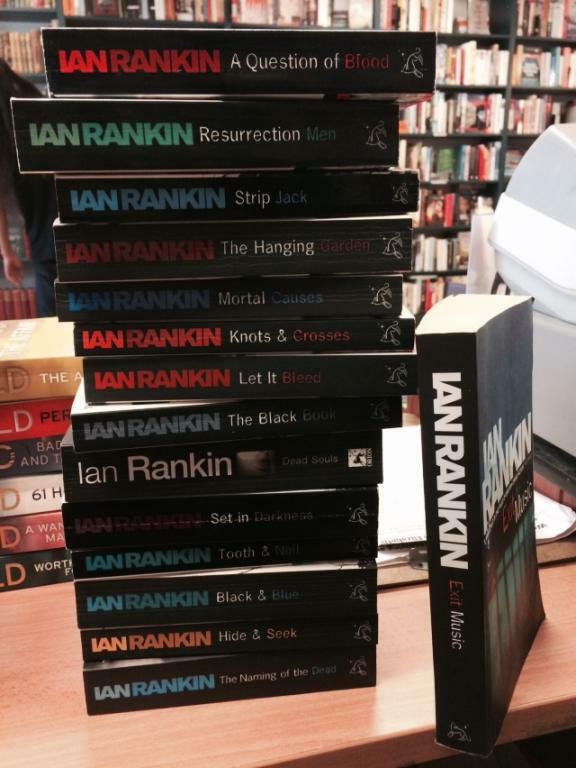 I began Ian Rankin’s series of novels about Scottish detective John Rebus years ago and loved them so much I painstakingly collected a matching set, with the exception of one rogue unmatching cover. When I heard that Rankin would be retiring Rebus and along with him the series I collected the last book, Exit Music, in trade paperback, not wanting to wait until it came out in small format. But then I got more books… and more… and more… and never ended up reading Rebus’ last hurrah. With all this in mind I thought it was an obvious candidate for the project. I would read that final part of the series, acknowledge that my love affair with John Rebus had reached a fitting end, then I would consign the complete collection over to the secondhand bookshop for a new reader to fall upon gleefully. So, I read and loved Exit Music. I thought it a perfect end to a series. I took the whole pile to the bookshop. Here, the bookseller informed me that Rankin had restarted the series a few years back. Rebus was Back. With a dawning sense of something sitting uneasily between delight and horror, I betook myself to the shelves and found the New Series. Even its cover taunted with me, with its REBUS IS BACK tagline emblazoned upon it. Get this: Rebus stayed retired, bugger him, for five years, then started working on cold cases. Exit Music was published in 2007 and soon afterwards I was no longer seeing the new fiction releases, having begun work in a nonfiction bookstore. By the time Rankin published Standing in Another Man’s Grave in 2012 I was working in journalism. He has now published a second title in the new series, Saints of the Shadow Bible, 2013. The harsh lesson: if you buy a book you don’t have time to read and hang on to it for eight years, you run the risk of the author actually being able to retire a bestselling series, get bored, re-launch the series and put out another two books, putting you hopelessly behind again. But now I know I have really begun to take the lesson to heart, because I put those new titles back on the shelf and Walked Away from it, not to mention from the rest of the collection. I don’t have the time right now, especially given this project is yet to run its course. Now for a brief note on Exit Music, which I waited, as I said, eight years to read. Hooray! It’s one of those stories in which a crusty old copper has only ten days to go until he retires. Obviously, a big nasty murder lands in his lap. In a surprising twist, old authority-hating Rebus finally sasses a boss so badly that the boss, incensed, suspends him for the remainder of his final days in the job. Again obviously (and I mean obviously in the best kind of way) Rebus ignores that directive as he has only days left and one last chance to put his nemesis, a crime boss who has eluded capture for Rebus’ entire career, away for good. It’s set in real time, just about, with the book divided into a chapter for each day plus a one-day epilogue, which makes for a ripper of a police procedural and a detailed and political portrait of the seedy Edinburgh underbelly Rankin has always evoked so sharply. Had it BEEN a swan song, I say bitterly, it would have been a damned good one – it’s full of fuss, blood and mess, to borrow a phrase from Rebus himself, and its bittersweet conclusion gave me a little shock of goosebumps. Mr Rankin, you have my undying respect. Argh, go on, write another one. Keep or kill? Already gone, my friends. Time off from The Curing of a Bibliomaniac is allowed, because my friend Sturdy lent me this alluring paperback and anything by J. K . Rowling, that is, Robert Galbraith, is essential reading. My history as a crime junkie dates back to a time after I finished my uni degree, filled with postmodern literature, ye olde English literature, film theory, poetry, Shakespeare, Shakespeare in film, Australian fiction, Australian fiction in film, etc, etc. This stuff was wicked, but it bruised my brain so severely that by the time I graduated I shuddered at the very sight of a Thinky Book. Enter crime. The compulsive nature of crime serials by excellent authors such as Val McDermid, Colin Dexter, Lee Child, Ian Rankin and Frances Fyfield, to name but a few, served as a panacea to my aching soul, serving up quality reading material in a structure I could rely upon to be relatively unchanging. 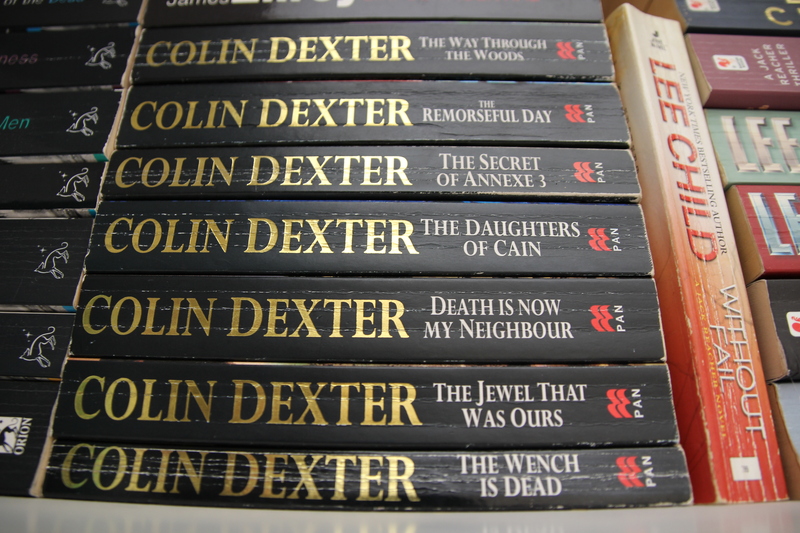 Not THAT proud of my matching Colin Dexter collection, jeez. Like a fool, I kept buying all kinds of books as well as these, hence large, slightly bibliomaniacal (is this a word?) collection of the unread. And the need for a cure. Hehehe. Searching for a cure for the unread. Get it? But I digress. Suffice it to say that when a friend delivers a succulent new morsel such as this, I drop everything and snuggle down and say goodbye to society for a couple of days. 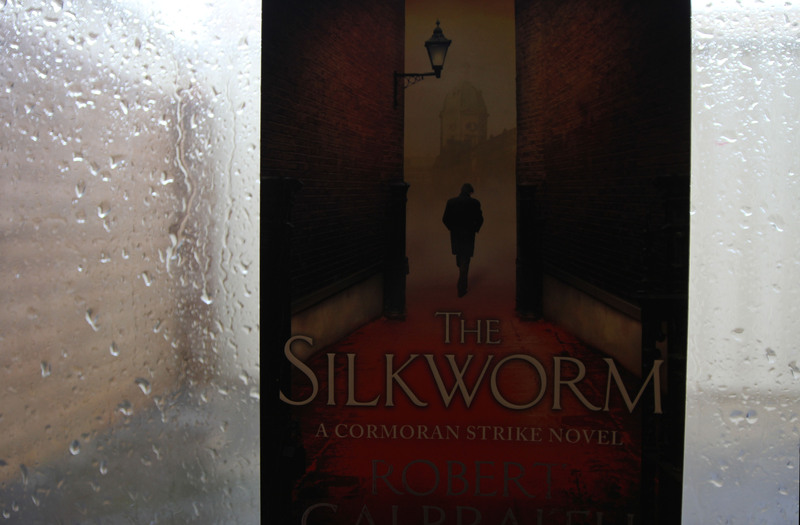 Silkworm did not disappoint – Galbraith’s writing is so deft and perceptive you can’t help but break into delighted smiles as you read, nodding in recognition, and sometimes even a giggle at some particularly incisive phrase. The evocation of London is such that it makes you long to see it in front of you as Strike (central character, ex-soldier-turned private detective) does. Well, at least it was raining in Perth. This is the second novel in the series, the first being The Cuckoo’s Calling, and as Sturdy says, there is some excellent character development in this instalment, with the promise of more to come. The same thing struck me about Silkworm as The Cuckoo’s Calling: Galbraith inhabits diverse worlds with remarkable comfort, moving from poverty to riches, and detailing industries from fashion to publishing as though born to them. This is a joy to read, a traditional, engrossing detective novel with everything it needs to be among the best in the genre: depth of character, tight plot, mood and style, with some deliciously shivery moments. It deserves to have real money spent on a physical book that takes up real space in your house. If you’ll indulge me in a cringey metaphor, it’s more satisfying than a good meal, because generally after good food you feel a bit overfull and regretful, whereas this is a perfect portion that leaves you wanting more. After continuing with How to Cure a Bibliomaniac, of course.